I am thrilled you like our One Room Challenge kitchen and breakfast room. We are over the moon excited about it. Thank you for your amazing comments and emails. There are a ton of amazing things featured in our reveal ... and as promised here are the sources. If you see something you would like to know more about, please leave me a comment! I still can't believe this is our kitchen!! I have dreamed of this space for so long and I still have to pinch myself every time I walk into it. I am thrilled with the result, I love the way it flows with spaces we already have and I love that we gather here daily. 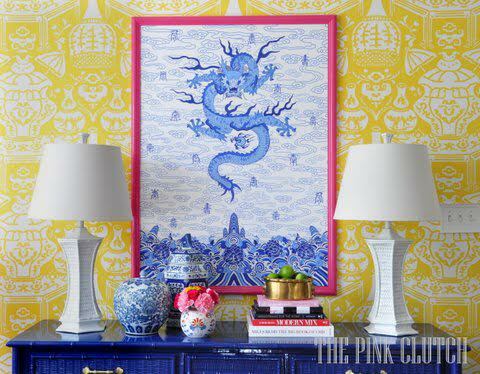 First of all that dragon ... created by The Pink Pagoda and drawn by her daughter Virginia and can be purchased here. Isn't she the bomb.com?!! The blue and white pottery was pulled from the porch. The small blue and white pottery piece and the brass bamboo container are vintage and all of these pieces were found while shopping for The Cellar. Books are from my collection and can be purchased from Amazon. This stack includes Monograms for the Home || Modern Mix || The Big Book of Chic || All in Good Taste. It also includes Design Her by Julianne Taylor which will be released on February 1. Amazing books ... all of them!! Claire Bella Studio is offering my readers a 20% discount to my readers. She has amazing fabric, pillows and wallpaper. Use the code PINKCLUTCH20. Pendant lights and hallway light from Lucent Lightshop. They are custom, and the closest thing on her site would be these. She is amazing about creating anything you need! Bar stools are vintage and the bamboo cushion fabric is from The Chinoiserie Collective. The hot pink trim fabric was from my fabric stash! Brass faucet is no longer available, but a similar one can be found here. That candle is the best smelling thing on the first floor. I can't believe it smells so amazing and truth be told I bought it for the blue and white tin. Avocado + Mint = success for sure! You know I love all things monogrammed! I can't believe how different my kitchen looks with the new tile. I was really wanting to replace the counter tops as well, but the budget just wasn't there. The new tile shows the counter tops in a completely different light and for the first time since we moved in I actually like them. It is amazing to me that a simple change can affect so many things! Well, new tile and the best cabinet paint, ever!! Grout is Silver. I will admit a gallery wall is my go to for any extra space I have. The pieces we chose for this space all fit together in a meaning for me. Many of you know that I grew up in Florida and that time means so much to me. It is the source of my love for color and all things bamboo and vintage. My grandfather used to take me to auctions when I was very little and the antiquing bug bit very early. Each of the pieces of art here represents our Florida history. It was really fun to me to be able to source so many fabulous pieces from different places that all fit together for such a special purpose. This is the view I am greeted with when I walk into the house and one I treasure for sure. Drexel Server lacquered by Parker Kennedy Living. When we removed the 1980s built in desk from this area I was shocked to see how much space it gave me. I had originally decided to use a desk from the den in the space and then realized how dumb that was. We didn't use the built in desk and all I would be doing was adding another space for my people to drop their stuff. No bueno! I happened upon this server while out shopping and walked away from it only to dream of it for two days. It was perfect for the space and I really needed more counter space. The coffee bar dream developed driving home that Saturday with my new server in the back of the car. It was a steal ... at less than $300 and has created an amazing extra counter top for me. Plus ... it just looks amazing! Ceiling paint is Borrowed Light and cabinet and trim paint All White in full gloss. This is my first time using Farrow & Ball paint and I will have a hard time now using anything else. Do you see that shine? It is the best paint we have ever used and I could not be more thrilled with the result. Blue server from Lanai Vintage. Lacquered by Parker Kennedy Living in Drawing Room Blue. Blue Willow plates are antique from family. This six week challenge would not have been possible without sponsors. They believed in me enough to let me chose products and use credits from them to create a space they had never seen. I am still in awe of the opportunity to work with so many companies that took me on blind faith. If I have missed something, please let me know ... I am happy to share all my sources!! What a beautiful Kitchen!! I am getting ready to redo in January. Ill have to refer back to this page I love the colors! Can you tell me more about the two white lamps on the Drexel server? I adore their shape!